Let’s get this out of the way: if you’ve any interest in drones but have been put off by the price, buy the Syma X5C. The X5C flies remarkably well, handles smoothly and the drone is surprisingly well built. It’s not without its flaws however: the remote is poorly made, the battery life is pretty short and the camera is barely worth mentioning. The Syma X5C can be purchased on Amazon for around $60, but at the end of this review we’ll be giving ours away! Although the Syma X5C is one of the cheapest quadrocopters with an HD camera, the Juyo Vonsan is $10 cheaper and has a resolution of 640 x 480, and the market is flooded with sub-$30 mini-drones without a camera. Syma also a cameraless X5 for around $40. The Syma X5C comes with everything you need to start flying. In the box is the drone, two spare propellers, four propeller guards, the remote control, the drone’s battery, a charger, a screwdriver, a 2 GB micro SD card, an adaptor for connecting it to your computer, and the passably translated instruction manual. Before starting you need to attach the prop guards and put four AA batteries in the remote. The same cannot be said about the remote. It’s light, rattles, and has fake buttons that do nothing. While the control sticks are, like the drone, surprisingly good, the overall package is mediocre. The control sticks provide about the right amount of resistance when you fly; you won’t accidentally push one too far but nor will you struggle to move one. The buttons and switches, on the other hand, are awful. It’s certainly not a deal breaker though. The manual that comes with the drone isn’t bad at all. It’s clearly been translated into English but is still understandable. Puzzling out what everything on the remote does takes a little while — especially because some of the buttons do nothing — but it’s worth doing. The hardest is that all the controls are relative to the drone. 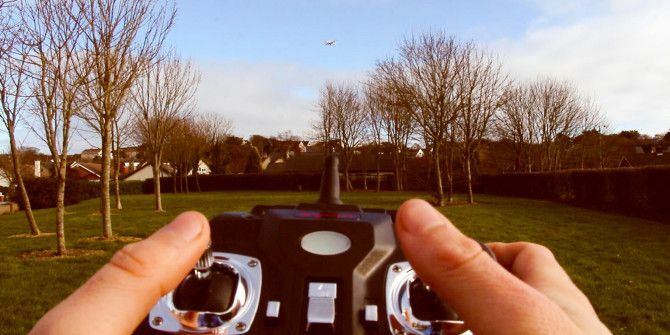 If the drone is facing towards you and you push forward on the control stick, it will fly towards you and not away. I found it best to always keep the X5C orientated so it was facing roughly away from me. This meant the controls behaved naturally. The X5C flies better outdoors as long as there is no wind — and I mean no wind. The X5C is extremely light and anything above a slight breeze will quickly have it floating off in the direction of the nearest tree. Indoors, the propellers are powerful enough to create some turbulence underneath the drone that can knock it off course. However, this has the advantage of teaching you to respond quickly and carefully on the controls. If the X5C isn’t flying stably, on the remote you can adjust the power balance to the propellers. This means you can correct any drift on the X-Z axis. I never had to. The X5C’s camera is fine and that’s really the highest praise I can offer. It’s got a 2MP camera that’s capable of 720p video as well. Neither the images nor the video look particularly good. If you’re interested in taking a video of the roof of your house or your kids playing football in the park then it will do. If you want to take amazing aerial photography Latest Drone Photography You Have To See To Believe Latest Drone Photography You Have To See To Believe Drone photography is an exciting new technology that allows anyone to take awesome aerial videos. This article runs down some of the best on the internet. Read More you’re going to need to invest a little more than $50. The battery lasts for about seven minutes. As it starts to die, the X5C will lose power and that’s your cue to land it before it takes on the aerodynamic properties of a rock. If you’re serious about flying it regularly, I’d recommend picking up two or three extra batteries. Changing them is easy. Syma also offer an X5 that doesn’t come with the camera for a little less. If you’re just buying the drone to practice flying it before upgrading to something more expensive, I’d recommend you get that instead. There are two main reasons to buy the Syma X5C: you interested in drone photography but want to learn on something cheaper than a DJI Phantom or you want a cool gadget to play around with occasionally. If either of these describes you, go and buy an X5C now. The X5C is cheap — and sturdy — enough that you can fly it without any fear of breaking the bank if something goes wrong. In all likelihood, you won’t actually damage the drone even if you fly it into things, but if you somehow do you’re not out several hundred dollars. It is absolutely perfect for getting the feel for piloting quadcopters before investing in something bigger and better. It’s also a pretty sweet gadget in its own right. If you know a child — or child-like-adult — who’s at all interested in planes, drones or cool gadgets, the X5C is a great present. When reviewing tech products I always try to keep in mind “you get what you pay for”. Dismissing a $200 Chromebook because it can’t run Photoshop doesn’t help anyone. With the Syma X5C you don’t get what you pay for: you get far, far more. Buy. Tremendous fun, great value, and perfect for anyone inexperienced with quadcopters.